In modern society, buildings are where we spend the vast majority of our waking and sleeping hours. Our facilities are man-made ecosystems—vast assemblages of interdependent living and non-living components. Facilities have become the primary habitat for the human species. As technology advances at a record pace, our man-made ecosystems are becoming ever more complex and sophisticated. These intricate collections of materials, infrastructure, machinery, and people, with countless spatial and temporal relationships and dependencies, require progressively more sophisticated tools to help us design and manage them. The recognition of facilities as habitat for modern man is leading to a revolution in facilities management. GIS technology is designed specifically for the management and analysis of spatial relationships, and offers many benefits to the facilities management community. It only seems logical to manage, model, and design our new man-made ecosystem with the same tried and true tools used to manage, model, and design traditional ecosystems. And this is already happening. Staff at the City of Masdar use GIS to model building information throughout the life cycle of the project. GIS has long been used to help measure the impact of a facility on a natural ecosystem, but today it is increasingly being used to plan, manage, and operate the man-made ecosystem that is the facility. Facilities managers are finding that these powerful GIS tools, used successfully for many years in fields such as environmental analysis and landscape planning, also support a broad range of applications inside and outside of buildings and facilities—applications such as operations planning, emergency management, ADA compliance, safety/security planning, space utilization and optimization, and more. In fact, GIS can be used throughout the lifecycle of a facility—from siting, design, and construction through ongoing use, maintenance, and adaptation, and ultimately through closing, repurposing, and reclamation. In the last several years there has been much interest in the integration of building information models (BIM) with GIS. These highly detailed 3D representations of buildings can be imported into GIS, integrated with your existing GIS database, synthesized with legacy 2D CAD data, and used for visualization and analysis at the building or facility scale. There is an emerging understanding that GIS can be extended into the built environment of individual buildings and campuses. Integrating BIM data into GIS data models provides the ability to leverage this information using the tools and applications of geoprocessing and visualization. In ArcGIS 10, we extended the data model and 3D tools to accommodate BIMs and other 3D building abstractions, and we have seen government organizations such as the National Institutes of Health as well as a number of universities and health care organizations integrating their BIM and 3D building models with GIS to better analyze and manage their facilities. “Practical Considerations for Integrating BIM and GIS, John Przybyla’s presentation at the 2010 GeoDesign Summit. 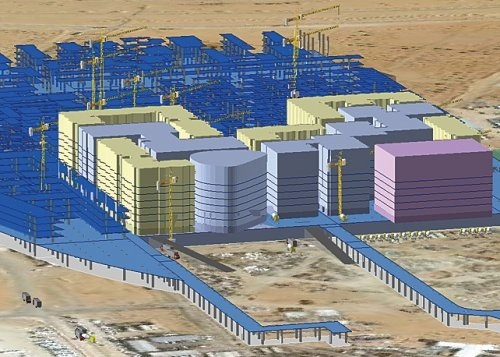 In Abu Dhabi, Masdar City uses a combination of BIM and GIS to plan and design buildings and infrastructure. And at NASA Langley Research Center’s New Town project in Virginia, building designers are working with GIS and facility managers to develop BIM and GIS interoperability. Organizations with large and small building portfolios, public or private, are capitalizing on this ability with applications to support facility planning, operations and maintenance, space utilization and move management, emergency planning, energy and sustainability management, and much more. Esri is actively evolving its platform for not only these applications but also other 3D applications in the GeoDesign space. BIM and GIS integration is not just about the building or the facility; it’s about the relationship between natural and man-made ecosystems. Our challenge is to design our man-made ecosystems to achieve the maximum benefit to society while minimizing short- and long-term impacts on the natural environment. As an integrative platform for management and analysis of all things spatial, I believe that GIS can meet this challenge. Jack Dangermond founded Esri with a vision that computer-based mapping and analysis could make significant contributions in the areas of geographic planning and environmental science. The recipient of 10 honorary doctorate degrees, he has served on advisory committees for the National Aeronautics and Space Administration, the Environmental Protection Agency, the National Academy of Sciences, and the National Science Foundation. This entry was posted in Vision and tagged BIM, building information models, geodesign, Masdar City. Bookmark the permalink.